Keeping up with modern skillsets is crucial if you want to succeed as a designer. All skills should be on the table from Adobe software to icon design and even RoR development. Unfortunately it can be difficult to learn all of this stuff from books and it’s not always viable to sign up for classes. This is why I’ve organized the top 10 online websites for teaching yourself new skills for the modern era. Each of these sites are popular with a variety of users from all over the world. It’s easy to learn design if you know where to start and know what to study. Take a peek at these online resources and see what they have to offer. Most designers already know about the ever-popular Tuts+ website featuring tutorials on a panoply of topics. But Tuts+ also has an enormous section of premium courses including web design, print design, video editing, coding, and photography. Their library is enormous and continues to grow with each passing month. If their online courses feel daunting you could try some free tutorials to get started with basic techniques. However the Tuts+ membership is dirt cheap and you’ll gain unlimited access to all 500+ tutorials. When it comes to learning new skills on the cheap I would highly recommend Tuts+ as your first option. There are many people who just want to be great at development, or designers who wish to improve their development skills. 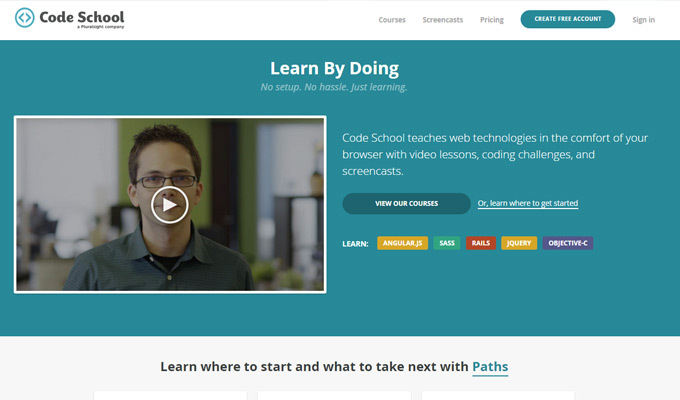 Code School is an online site with video lessons teaching various web technologies. You can choose from a number of learning paths which focus on a particular language or development technology. Although web paths are popular, you can also choose to learn more traditional programming like Ruby or Objective-C. The site is quite small right now but it has a detailed library of content for aspiring developers. If you need to learn the raw bare-bones info about any program then Lynda is what you need. The online library of Lynda tutorials spans the gamut of every program you can ever imagine. You’ll find crash courses for every piece of Adobe software, all 3D/CAD programs, and many development technologies as well. 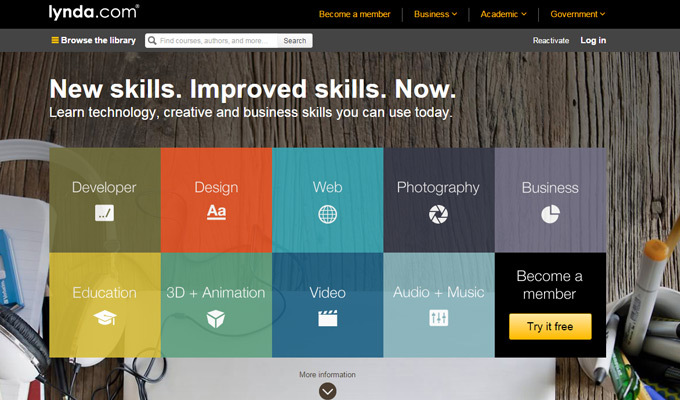 Lynda is on the pricier side but they have discounts for students and some companies as well. Lynda videos probably won’t teach a lot of specific techniques but they will teach the absolute basics of any software or programming language. Their content is best for newbies or intermediates who want to truly comprehend all of the tools, menus, buttons, and features in a program. The courses at Digital Tutors are very specific focusing on real-world techniques for design programs. Digital Tutors is more of a designer’s paradise which has a library of tutorials for InDesign, Photoshop, Illustrator, After Effects, Cinema 4D, Zbrush… the list is practically endless. But programmers should consider Digital Tutor’s parent company Pluralsight. While DT focuses more on design and visual effects, Pluralsight focuses on programming and IT architecture. You can learn everything from PHP to Java or SQL, even delving into more hardware subjects like server management. 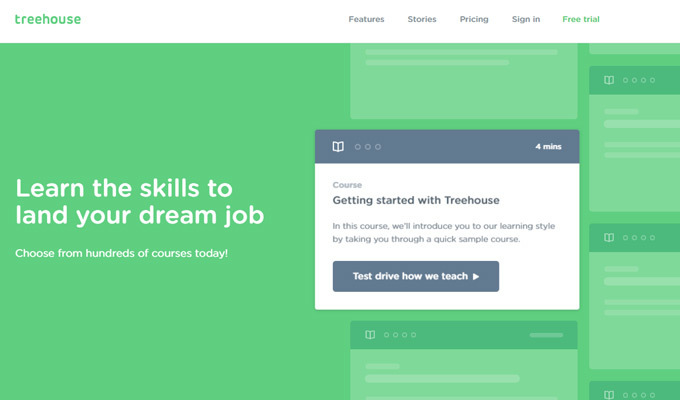 If you’re a web designer who wants to learn more about the development process then please take a look at Treehouse. While they do offer some design courses, the majority of their content covers frontend/backend development for websites and mobile apps. The great thing about Treehouse is that they’re affordable and easy to use. While Tuts+ may have a larger swath of content, Treehouse focuses more on development and places a heavy focus on detail. Whether you want to build websites or mobile apps Treehouse is the place to be. Fans of Lynda may not know about the wonderful content found on Video2brain even though both companies are heavily related. 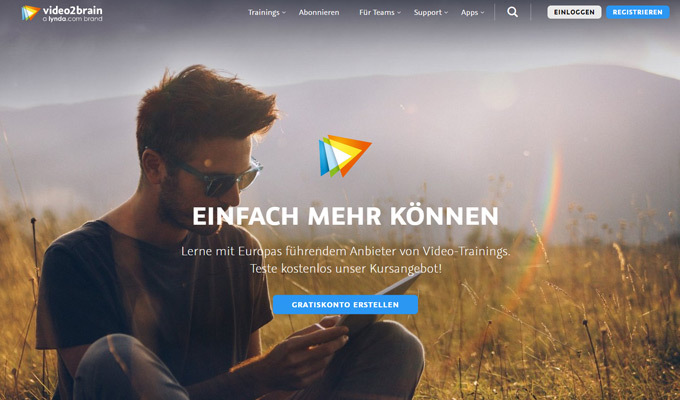 Video2brain is now owned by Lynda but still hosts its own content for new students. The courses mostly follow design and photography techniques with a deep focus on Adobe software. Video2brain is also meant for people who want to learn the ins-and-outs of a program without any prior experience. Each course is many hours long and covers everything you’d need to know. If you want to check out their library you’ll need to go through Lynda – but in my opinion that’s like getting 2 awesome libraries for the price of one! Online learning doesn’t always need to come from professional companies and teachers. The online resource Udemy is a prime example of this teaching style. Professionals from all areas will create their own lessons and sell them on Udemy. Topics span from design to development and many other unrelated areas. 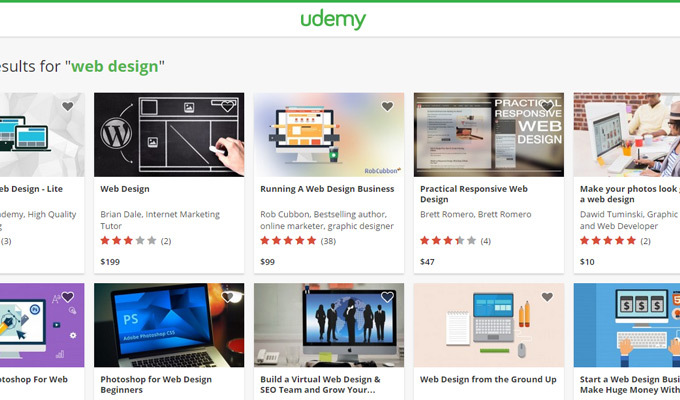 If you want to learn about a specific topic there’s probably a couple Udemy courses ready to go. The only downside is that content quality can be somewhat sporadic, so be sure to read through user reviews before purchasing a course. Aspiring concept artists, animators, visual development artists, or character designers will fall in love with CGMA. 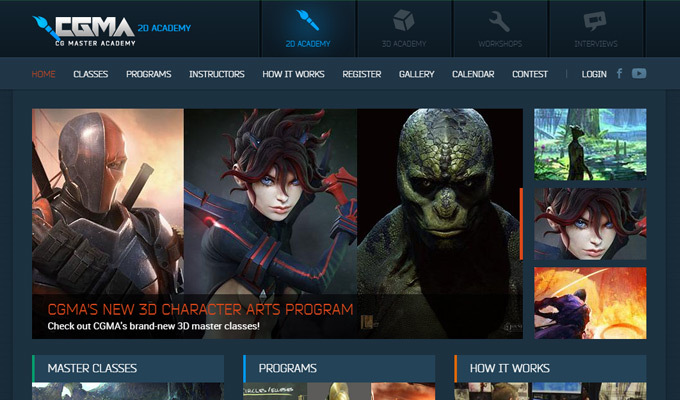 This name stands for the CG Master Academy which focuses on 2D and 3D CG artwork. Most of their courses require a fundamental understanding of fine art principles shape, perspective, and value, but there are other courses meant for beginners. 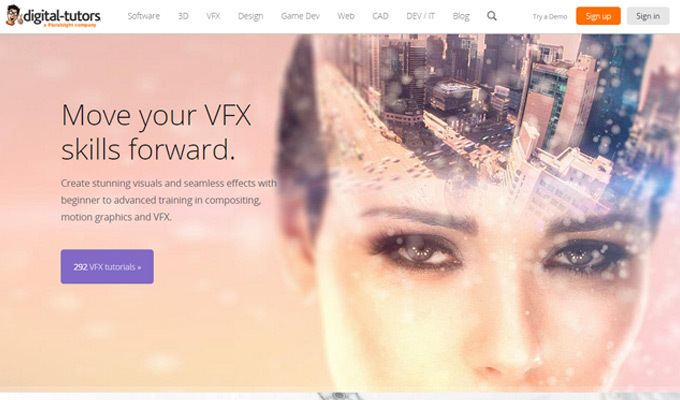 CGMA is for people who want to get started towards a career in the entertainment industry, or for people who want to improve their existing CG design skillset. However CGMA doesn’t typically let you stream videos at anytime like other websites. Their courses run with a professional instructor over a course of 4-12 weeks and require homework too. It’s definitely intense but also effective at teaching very tough concepts over the Internet. Photographers or digital designers who work with photographs will fall in love with the Phlearn course library. 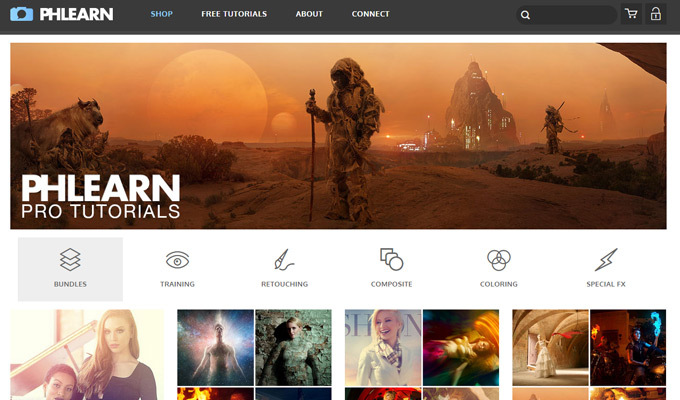 Phlearn has a series of free tutorials along with premium courses all focused on photography and photo compositing. Whether you want to composite advertisements, cereal boxes, or movie posters, these tutorials can get you there. Many of the videos assume you already understand the basics of Photoshop but just need to learn more about how to perform specific tasks. So Phlearn is geared more towards intermediate-to-advanced users, but there are some courses made for newcomers. 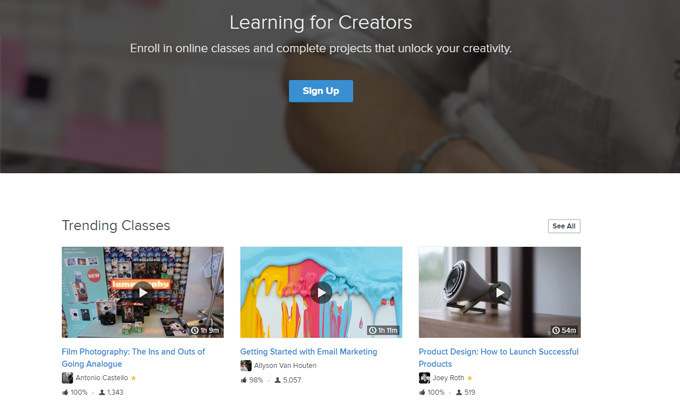 Skillshare is one of the newest learning platforms on this list. 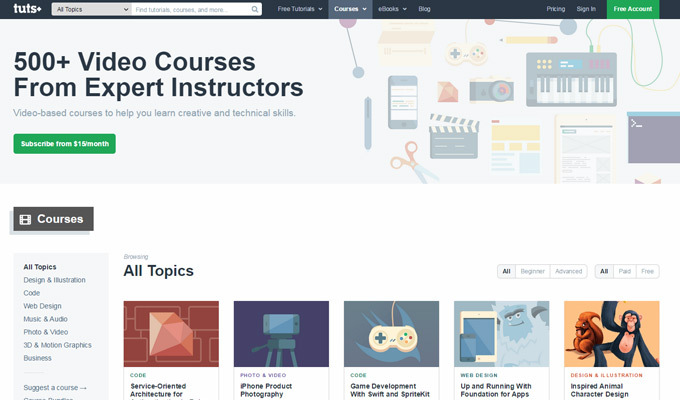 Their courses are made similar to Udemy where designers/developers can submit their own tutorials into the library. Topics range beyond just web design to include After Effects editing and print design. Web development is also a topic gaining traction on the site. Skillshare is still new but it’s worth remembering to see if any courses fit your learning criteria. Although online courses are the best place to get started, everyone has to venture off onto their own path at some point. This is why many designers get started with the basics but eventually move onto building their own stuff. Nevertheless each of these websites should prove vital to your success as a designer. Nowadays it’s possible to learn everything from photo compositing to SVG animation or UI design with Sketch – all from the comfort of your office. It may seem overwhelming at first but the best course of action is to pick one area of focus and just get started. You’ll be thanking yourself later.